Orange and chocolate are great friends. Both grow in tropical climates, and as always, I marvel at the creativity of the individual who once thought, “hmm, I like chocolate, and I like oranges…I wonder what would happen it I paired chocolate and orange together?” Brilliance, that’s what. I adapted the recipe for this coffee cake from one in the Better Homes & Gardens Baking book, using orange zest instead of chopped peel and milk chocolate chips instead of semi-sweet. The great thing is that once you zest your orange, you can use the juice from it in this recipe as well. You could probably do without the pecans if you wanted to, but they add a nice crunchy texture. Preheat oven to 350 degrees. Grease a 9 x 13 baking pan. In a medium bowl, combine the 1/2 cup flour, brown sugar, and cocoa powder. Add butter and rub in with your hands until the mixture has a texture like coarse crumbs. Stir in pecans and chocolate chips; set aside. In a large bowl, combine flour, baking soda, baking powder, salt, and orange zest. Mix well, using your fingers to distribute the zest as evenly as you can. In a mixing bowl, beat butter and sugar for 2 minutes. Add eggs, 1 at a time, mixing well after each addition. Add sour cream, milk, orange juice, and vanilla and beat until well-combined. Add flour mixture in several batches, beating until combined as you go. Continue beating for about 2 minutes until the mixture is smooth. Pour half of the batter into your prepared pan. Top with half the streusel mixture and use the back of a spoon to gently press the streusel into the batter. 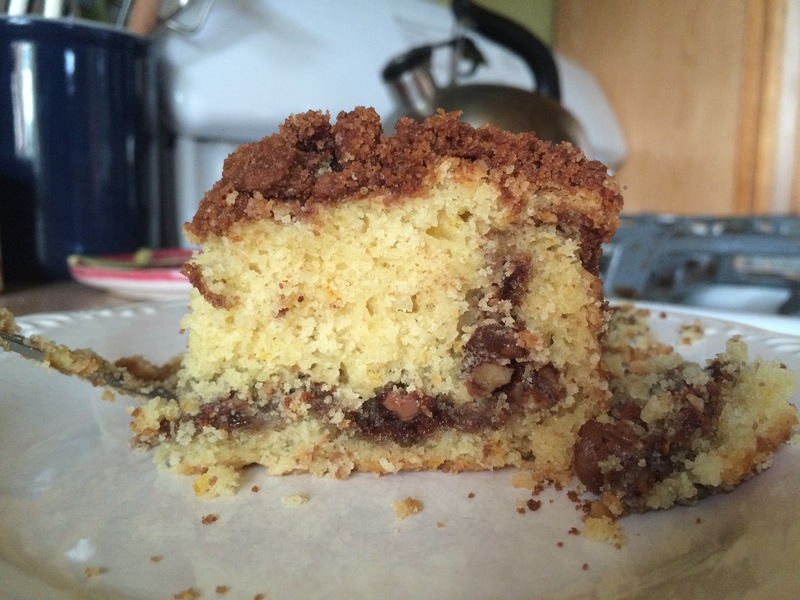 Repeat with remaining batter and streusel. Bake for 50-55 minutes, until a cake tester comes out clean. Remove from oven and cool on a wire rack. This cake can be served warm, or at room temperature.